The Adventure Holiday is geared for people who are looking to do a lot while they are in Bali, and to pack every minute with activities and adventure that showcase what Bali has to offer. Ideas on this page are our suggestions for your Adventure Holiday in Bali. AquaMarine Diving – Bali’s expert staff will customise an itinerary and package just for you! Bali has a multitude of possible activities. In the “Adventure Holiday Package” we’ve included Surfing, Scuba Diving, Horse riding, Whitewater Rafting, Cycling and Trekking. Dive Areas: Tulamben Bay, Nusa Penida, Padangbai/Candidasa or sites nominated by you. Suggested Inclusions: Village Cycling, Jungle Trekking, Kayaking, Bird Watching, Uluwatu Temple Sunset Tour & Kecak Dance. 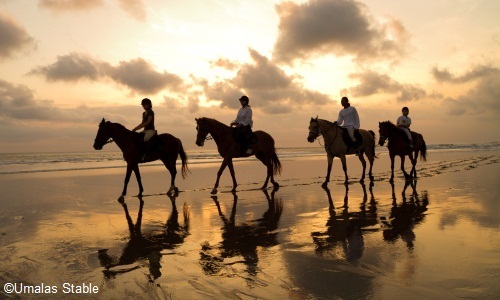 Surfing, Horse riding, Whitewater Rafting, Cycling, Sunrise Trekking. Day 1 Arrival in Bali. Airport pick-up and transfer to Southwest Bali or Sanur hotel. Day 2 A full or half day surfing lesson on Kuta’s world-famous beach and then, after a shower and change of clothes, maybe a sunset horse ride. Day 3 In the morning AquaMarine will transfer you to Tulamben on the north east coast. Tulamben Bay is world famous for the 120m USAT Liberty Shipwreck – divers travel from around the world to dive here. It is suitable for all levels including Introductory Diving and snorkelling, and is probably the world’s easiest wreck dive! Why not include a night dive on the wreck – an unforgettable experience. Day 4 Today we’ll organise a day of diving outside Padangbai/Candidasa – perhaps at Blue Lagoon/Jepun (also a favourite with snorkellers and u/w photographers) or over at Nusa Penida, perhaps including Manta Point. AquaMarine will provide great boat diving at the dive sites that best suit you. Transfer to Ubud, central foothills. Day 5 Today you might like to try whitewater rafting on the Ayung River, followed by trekking or cycling in the Ubud area. Day 6 Very early pickup for Mount Batur Sunrise Trek, it’s steep and you need to be fit. Afterwards, maybe you’d like to spend the afternoon in the hotel spa, relaxing tired muscles after the strenuous climb! Day 7 Check out for transfer to airport; depart Bali.